Christine Bachoc (Université Bordeaux) and Frank Vallentin (Centrum voor Wiskunde en Informatica, Amsterdam), have found new upper bounds for 'kissing' in higher dimensions. 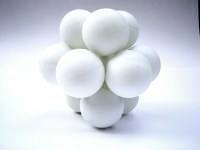 In geometry the kissing number is the maximum number of non-overlapping unit balls that can simultaneously touch a central unit ball. In two dimensions the kissing number is six. You can clearly see this if you group euro coins around one central euro coin. The kissing number is only known for the dimensions 1, 2, 3, 4, 8 and 24. Jan van Eijck has been appointed NIAS fellow on 1 September 2006. For five months he will be engaged in research on Games, Action and Social Software at the Netherlands Institute for Advanced Study in the Humanities and Social Sciences (NIAS) in Wassenaar. During this period, scientists from different disciplines - philosophy, logic, computer science, psychology, and economics - collaborate in an intensive interactive setting to find a more unified view of social mechanisms. Computer scientist Nitin Saxena will start as a postdoc researcher at CWI on 1 September 2006. Saxena is well known as co-author of the article 'PRIMES is in P', which received a lot of media attention the last few years. Together with Manindra Agrawal and Neeraj Kayal he won the 2006 Gödel Prize for this 'outstanding journal article in theoretical computer science' in April and, by that, is the youngest Gödel Prize winner ever. He also won the 2006 Fulkerson Prize. A reliable internet connection − that is what users are looking for. Bahareh Badban, PhD student at CWI, studied methods to improve TCP, one of the most important protocols for Internet applications. She will defend her thesis 'Verification Techniques for Extensions of Equality' on 7 September 2006 at the Vrije Universiteit Amsterdam. Dion Gijswijt, former PhD student of Lex Schrijver, was nominated for the A.W. Tucker Prize by the Mathematical Programming Society. The jury announced this during the International Symposium on Mathematical Programming (ISMP) 2006 in Rio de Janeiro on 31 July. The Tucker Prize is awarded every three years for 'an outstanding paper or thesis solely authored by a student'. Gijswijt was one of the three international finalists for his thesis, called 'Matrix algebras and semidefinite programming techniques for codes'. He was seconded at CWI from 2002 until 2005. Bert Gerards will give an invited lecture at the International Congress of Mathematicians (ICM) 2006 on 28 August in Madrid. It is a great honour to speak at ICM, the most important conference for mathematicians in the world with thousands of participants. The conference is organized every four years by the International Mathematical Union. Bert Gerards is cluster leader at CWI and part-time professor at the Technische Universiteit Eindhoven. NWO granted two FOCUS subsidies to CWI researchers. FOCUS is the open part of the Bsik programme BRICKS, which has been developed by CWI and NWO Physical Sciences to stimulate fundamental computer science research. The programme will deliver important building blocks for the computer of the future. Ute Ebert has been invited to become a member of the Royal Holland Society of Sciences and Humanities (Koninklijke Hollandsche Maatschappij der Wetenschappen) in Haarlem, the oldest academic society in the Netherlands. Established in 1752, the society aims at promoting science by awarding prizes and stipendia. Nowadays, it aspires to bridge the gap between science and society. Analyzing complex databases in record time - for his searching techniques Peter Boncz (CWI) won the ICTRegie Award 2006 on May 16. Martin Rem, chair of the jury said: "The challenges for Peter Boncz were not only scientific. The real art was coupling research results to a convincing business model. And he succeeded. With the developed knowledge CWI could launch a successful spin-off company: Data Distilleries, now taken over by SPSS. Boncz showed that the actual application of scientific knowledge in the field of computer science can lead to impressive results." How can bacteria find their way towards a source of sugar? This was the topic of the lecture 'Design Principals of a Bacterial Signalling Network' of Professor Jens Timmer of the University of Freiburg in Germany. He spoke at CWI during the first seminar in the Seminar Series Systems Biology of the Bio Centrum Amsterdam, on Monday 8 May 2006. The Fokker F27 Friendship won the Best Dutch Design Election on May 5 2006, organized by the Dutch newspaper NRC Handelsblad together with the Premsela Stichting. At the time, the Mathematisch Centrum - now CWI - made so-called flutter computations for the wings on one of the first computers in the Netherlands. Flutter is a vibration which can vary from a light 'buzz' to serious damage or destruction of the aircraft. With the computations the form of the wing could be adapted to minimize flutter. Over five thousand people chose the F27 design from 25 nominees. Prof. dr. Krzysztof Apt (CWI and Universiteit van Amsterdam) has been elected as Member of the Academia Europaea in the Informatics Section on April 26, 2006. This section has 66 members of whom seven scientists come from the Netherlands. Other new members of this section are Prof. dr. Jan Bergstra (Universiteit van Amsterdam and Utrecht University) and Prof. dr. The first .nl domain in the Netherlands, 'cwi.nl' of the Centrum voor Wiskunde en Informatica (CWI) in Amsterdam, celebrates its 20th anniversary on May 1, 2006. On April 25, 1986, CWI took care of registering the NL top level domain in the framework of its international and national networking activities. This first country domain was registered by Piet Beertema (CWI), who played a central role within EUnet - the predecessor of the European Internet. The first domain he registered was cwi.nl. Better planning for trains with mathematical models - this is the subject of the dissertation of Gabor Maroti of the Centrum voor Wiskunde en Informatica (CWI). Maroti studied several optimization models for tactical and operational planning and maintenance routing. He looked at efficiency, robustness (immunity for failures) and service level for clients - their chances to have a seat. With the models, NS can compare these aspects quantitatively and choose a good balance between them. On Monday 10 April 2006, during the opening of the Kennismarkt of the ICT Kennis Congress in Amsterdam, the Minister of Education, Culture and Science Maria van der Hoeven, announced the three nominees for the ICTRegie Award 2006. Amongst them is dr. P.A. (Peter) Boncz, researcher at the Centrum voor Wiskunde en Informatica in the Information Systems research group. The Award will be presented on 16 May 2006. Can physicists obtain a 3D image of the positions of all individual atoms inside tiny crystals? The Centrum voor Wiskunde en Informatica (CWI) is rated 'excellent' by an international evaluation committee. The Netherlands Organisation for Scientific Research NWO announced this in a press release on March 15, 2006. "The combination of mathematics and computer science and fundamental and applied research gives the institute a strong and unique position in the international research landscape," NWO said. NWO subjected six institutes to an external evaluation: ASTRON, CWI, ING, NIOZ, NSCR and SRON. Jan Karel Lenstra, general director of CWI, pleaded for a Minister of Science and Technology in his speech during the festivities of the 60th anniversary of the Centrum voor Wiskunde en Informatica, on February 9, 2006, in Amsterdam. Lenstra: "Simply put: The country needs innovation, so it sets out to turn the brains of today into the money of tomorrow, on a 24-hour basis. True innovation comes from curiosity, serendipity and good conditions, not from pressure or from a law that the Netherlands will be number 1 in five years from now. Global warming of the surface layers of the oceans reduces the upward transport of nutrients. This generates chaos among the plankton, according to researchers of the University of Amsterdam (UvA), the Centrum voor Wiskunde en Informatica (CWI), and the University of Hawaii (USA). In Nature of 19 January 2006 they present advanced computer simulations, which predict that plankton growth will show strong fluctuations when the supply of nutrients is reduced. This prediction was rather unexpected: It contradicts the idea that deep plankton would represent a very stable system. The Netherlands Organization for Scientific Research NWO has awarded funding to three projects that involve CWI's Non-linear PDE group. This was announced in December 2003. The subsidies are part of NWO's Computational Life Sciences programme. The Dutch Ministry of Economic Affairs has allocated funding to the software test development project TT-MEDAL. This was announced on November 12, 2003. TT-MEDAL is a cooperation of CWI's Specification and Analysis of Embedded Systems group SEN2 (headed by Wan Fokkink), LogicaCMG, ProRail and Improve QS. An international team of mathematicians and computer scientists including two CWI researchers has found the two prime factors of a specially prepared encryption testing number called RSA-576, a number of 576 bits or 174 digits. This was announced on December 3, 2003 by team leader Jens Franke from Bonn University. Factoring the number is equivalent to cracking a key of 576 bits in the widely used RSA crypto system. The security of this crypto system is based on the assumption that such large numbers are hard to factor. Identifying unknown composers, automatically recognizing languages, finding the origin of new strains of viruses. These are just a few examples of the many possibilities of the CompLearn Toolkit, a compression based pattern recognition program made by CWI researcher Rudi Cilibrasi, available since October. The Dutch government has allocated 12 million euros to the BRICKS project as a part of the BSIK investment program. The Ministry of Economic Affairs announced this on November 28, 2003. BRICKS is coordinated by CWI. Furthermore, the institute participates in two other ICT projects selected for BSIK funding, MultimediaN and Virtual Lab e-Science. The 2003 edition of CWI's business day CWI in Bedrijf on October, 17 featured a novelty: Erik Huizer of NOB Cross Media Facilities demonstrated the set top box that will be used in several Dutch internet video pilot projects. This device shows DVD quality web broadcasts like NOB's First Mile TV on an ordinary television screen. The demonstration was part of Huizer's presentation on the current state of affairs of internet video broadcasting. CWI's Ph.D. student Miranda van Uitert has identified a number of causes of congestion in Generalized Processor Sharing (GPS) communication networks. GPS is a technique to schedule incoming network traffic at switches. Bandwidth is assigned to different types of traffic according to pre-defined weights. GPS allows the network operator to prioritize traffic types that require small delays like voice data over less demanding types like e-mail. On Monday, November 17 2003, it is exactly fifteen years ago that Europe was connected to the Internet. This connection was established at CWI, the Centre for Mathematics and Computer Science in the Netherlands. The institute was the first non-American organization to gain access to the American science network NSFnet, which was the equivalent of Internet at the time. The connection was a result of extensive negotiations with the American Internet administrators, in particular by CWI's network manager Piet Beertema and his colleagues. The Netherlands Organization for Scientific Research (NWO) has awarded a VIDI grant to CWI researcher Mark Peletier for his mathematical research of the aggregation of molecules. Particular molecules form flat or stringlike structures, instead of shapeless lumps. Lipid molecules for example, aggregate in this way to form cell membranes. These structures are essential to the way living cells function.